A well tested and professional grade shin guard. These leather encased pads hug the leg tightly and are secured by two rear buckle loops as well as a single elastic strap around the foot. The construction of the guard and strapping makes these among the most durable shin guards ever created. The thick padding protects against hard strikes and preserves your shins during intense sparring or bag work. Email your friend about the Pro Leather Shin Instead Guard. 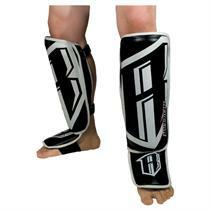 Ask a question about the Pro Leather Shin Instead Guard.